Ok, here is the scenario: you’ve developed a brand-new product or created an extremely useful service that’s ready to be shared with the world. But there is just one snag: you have little or no knowledge of how to effectively sell online. You need a set of tools to help you set up, develop, and grow your e-commerce business. But you are on a tight budget and have to hang on to every dollar until your online store becomes profitable. Luckily for you, there are lots of free or low-cost options e-commerce beginners can make a great use of. The tools listed below can bring good value to those who are short on e-commerce experience, time and staff. 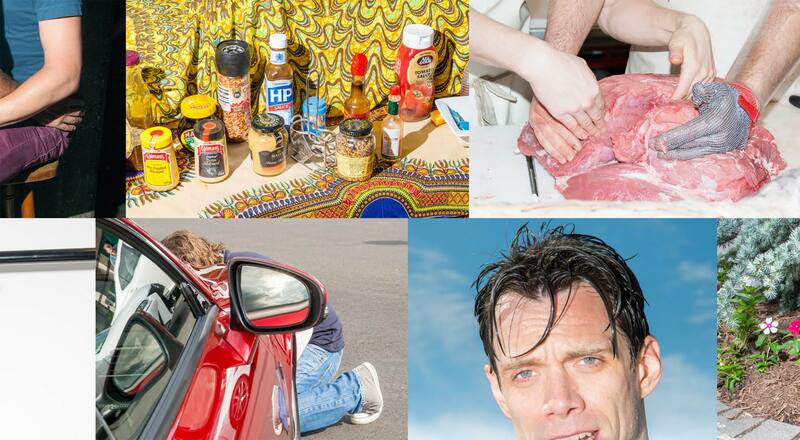 What is more, these tools don’t require huge investments and are pretty easy to master. The choice of a platform is perhaps the most fundamental decision an online entrepreneur makes in the early life of their business. And this decision can actually make or break one’s whole e-commerce game. 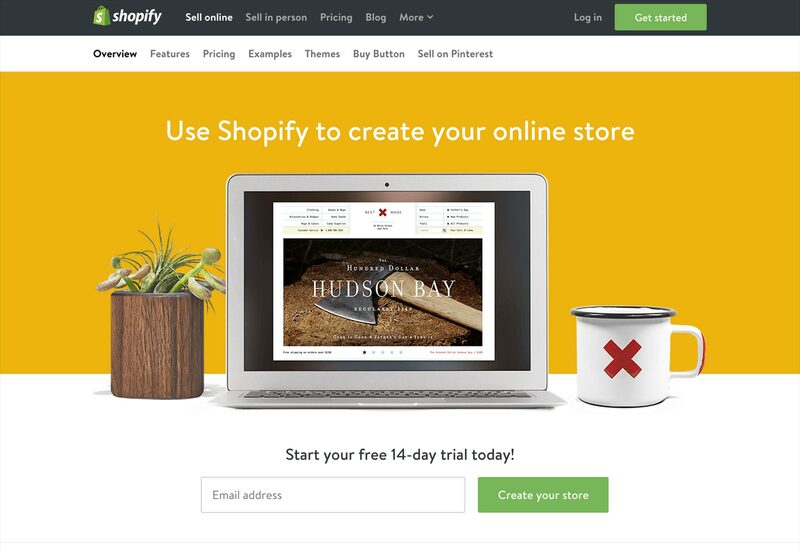 Shopify is a hosted, template-based platform that offers an abundance of features easy to use for e-commerce novices. Their sites start at $29 USD per month. The unlimited package with no transaction fees costs $179 USD monthly. The platform comes with eye-candy template designs, SEO facilities and a wide range of home-grown measurement and reporting tools. On top of that, the default platform features include: automated store backups, Paypal payment options, Google Checkout and the support of all major credit cards. Shopify has its own app store where you can find tons of products that plug in seamlessly into the platform. So if you need a special or customized feature for your online shop, you can find an extension for that here and avoid paying for its development. The biggest downside of Shopify (and any other hosted e-commerce platform) is the limited ability to change the “checkout” page. Yes, you have some control over it, but it doesn’t allow you to fully adjust the page for your needs. Hence, if your goal is to design the checkout page to be exactly how you want, the only way to do that is to find a hosted solution. Like Shopify, Bigcommerce is a hosted, template-based e-commerce platform. The cheapest Basic package starts at $29.95 USD per month, while the Platinum one costs $199.95 USD every month (which is rather expensive in comparison with the competition). The key advantages of the platform are its speed, simplicity and ease of use. 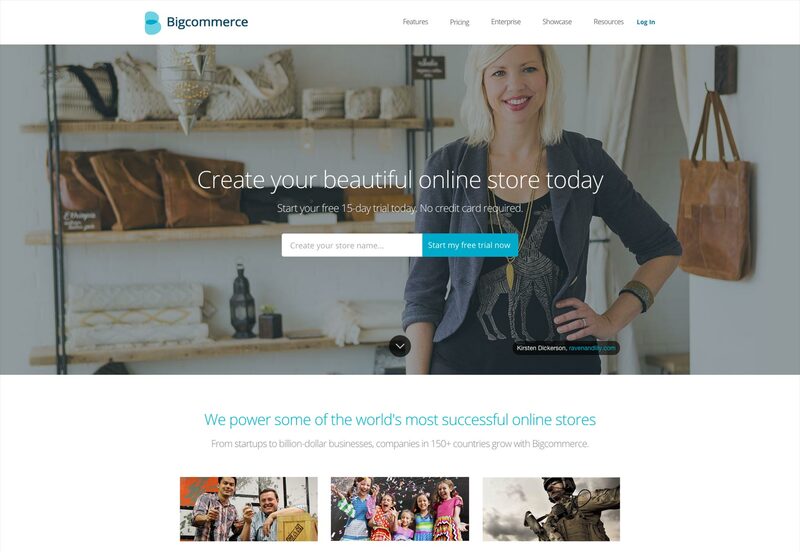 With Bigcommerce you can easily set your site’s look-and-feel, manage merchandising, and everything business-wise. 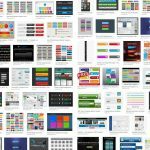 The platform is equipped with dozens of unique templates and an easy-to-use WYSIWYG editor. So if you have just some basic knowledge of HTML, it’s totally fine. With the editor you can quickly tailor your e-commerce website and adjust it for your needs. The Bigcommerce platform embraces all the essentials of e-commerce. It is equipped with a bundle of useful features that let a store owner add products, manage them and customize store merchandise with a bit of detail (including Bulk Pricing and adding Google Shopping). All products can be sorted by categories, thus creating a hierarchy for your online store. From there, a store admin gets a wide selection of options to manage transactions and engage with customers. Also, Bigcommerce can boast some great marketing features. It lets you pamper your customers with daily deals and rules-based promotions, create coupons for individual discounts. You can recover lost sales with the abandoned cart alerts functionality. The biggest disadvantage of the platform, however, is a very poor app marketplace. 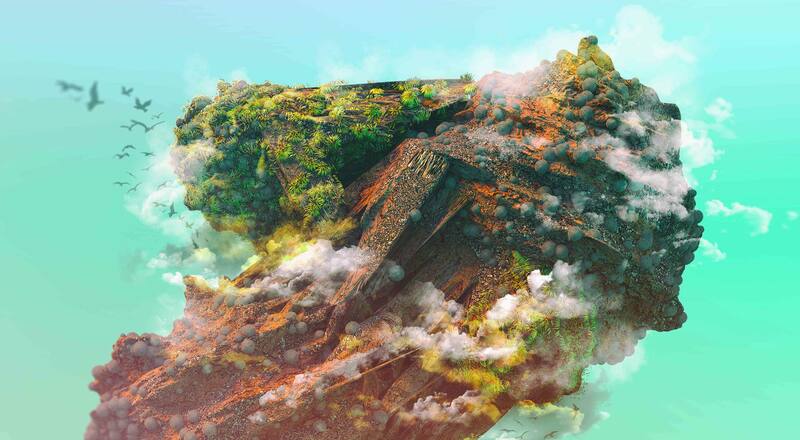 Recently launched, it still doesn’t have the depth or breadth of other platforms. So when it comes to very custom solutions, you will have to hire a developer. Magento is the best choice for those, who need a completely customizable online store from the start. 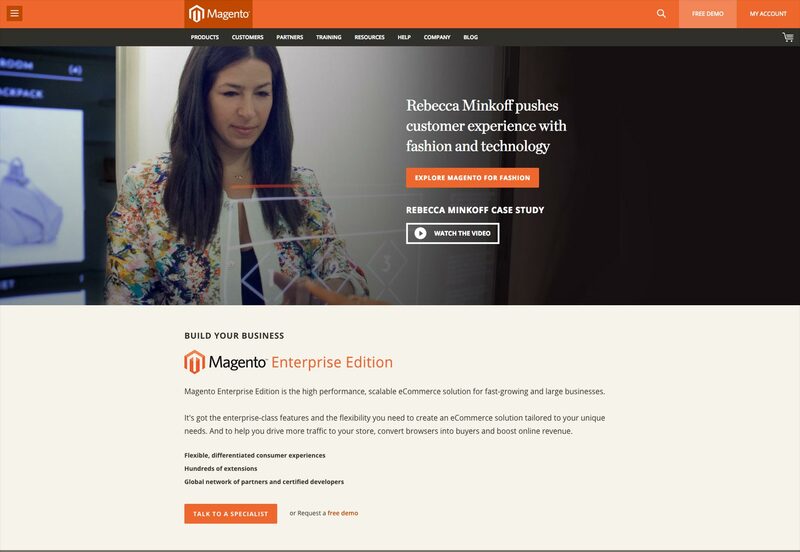 Unlike Shopify and Bigcommerce, Magento is an open-source, self-hosted e-commerce solution, which lets you tailor-make any aspect of your online store. Also, it’s the best choice for those who plan to expand their commerce business and run more than one online store. As for the the final 1-year price of Magento-based store, it may may vary from $1-3,000 USD to $100,000 USD (and even more). Basically, the price of a Magento-based store depends on what your goals are and how far you go in customizing your online store. It’s comparatively cheap if you need only the basic functionality and quite pricey if you want to fully adjust your e-commerce for your needs. Also note, that you should also take into consideration hosting expenses (about $300-500 per month). When it comes to scalability and flexibility, Magento is definitely the best choice. The platform covers all the needs of a serious e-commerce website: it offers a top-notch reporting functionality, is capable of dealing with complex discounts and vouchers, and can be seamlessly integrated with other systems (for example, systems for accounting or stock control). The key advantages of the platform are its ultimate customizability (you can adjust the platform for literally any e-commerce operation) and a big, helpful community. There are lots of professional and well-qualified contributors who can always give you a helpful hand. 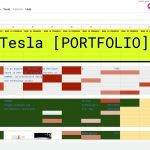 There is also a huge amount of resources that will help you master the use of the platform: official documentation, e-books, video tutorials, blog posts, etc. Like Shopify, Magento also has its own App Store called Magento Connect. It offers a wide selection of free and paid solutions for customizing the platform. The store is cluttered with tons of low-quality copycat extensions, though (it’s a downside of an open source platform). The choice of a payment provider is extremely important. It’s a partner to whom you entrust your income, and who will be in charge of managing your money. 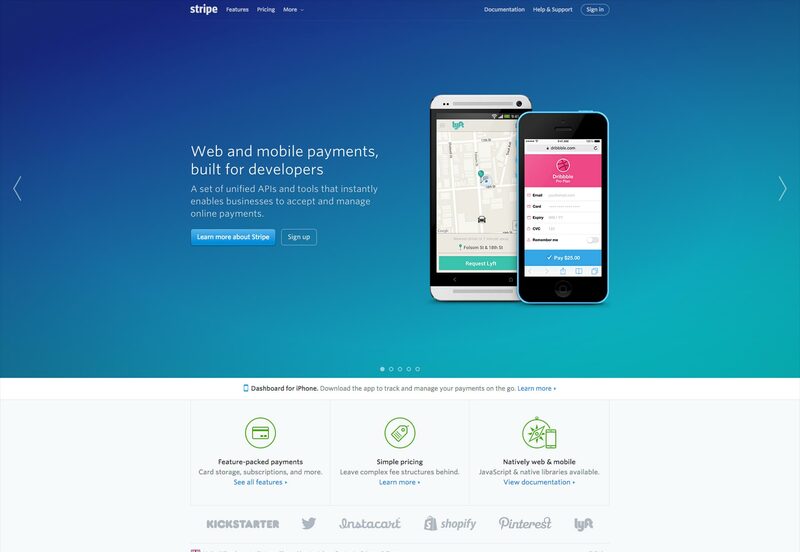 Stripe is a popular payment processing service designed to help online merchants accept payments through their websites. The service is fitted with “over 100 features” that can help in processing various types of online payments. 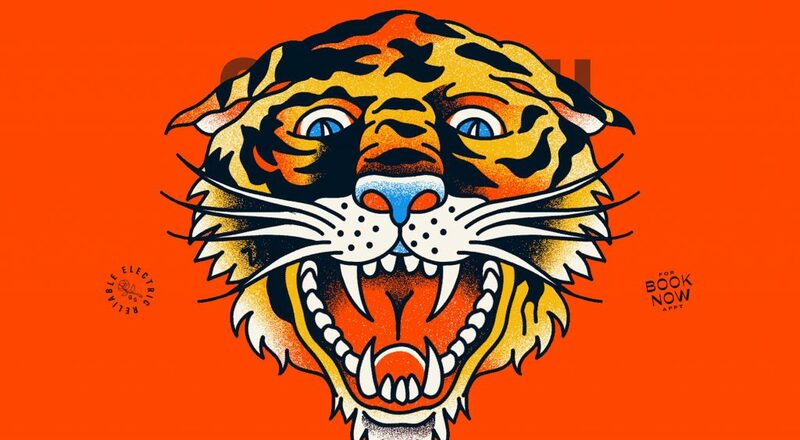 Also, Stripe can be easily customized to meet specific requirements of practically any online business. Stripe includes accounts in such countries as the US, Canada, the UK and Ireland. Also, the service runs beta testing of accounts in some other European countries and Australia. It allows merchants to accept payments in over 135 currencies (the conversion rate is calculated in real-time) which is a great point for those who are planning to expand their business to new markets. Stripe provides a wide range of options for charging on subscription-based products, lets online merchants easily manage discount coupons, and issues free trials. On top of that, the platform delivers informative reports and includes integration with QuickBooks. Stripe APIs offer a solid and well-considered framework for those who want to adjust the system for their personal needs. The system can be easily integrated with, and built upon, in a variety of languages (including PHP, Java, Node, Ruby and others). And the last but not least, Stripe offers the highest standards of fraud protection and security management. All of this makes the platform a good choice for beginner online entrepreneurs. PayPal is a global payment provider that is available in 203 markets all over the globe. It lets online merchants accept payments in over 100 currencies, withdraw funds to bank accounts in 57 currencies, and hold balances in 26 currencies. With PayPal e-commerce website owners can accept a various types of payments, including credit and debit cards, eChecks and internal system payments. Customers love PayPal as it enables them to pay online without revealing their financial details. 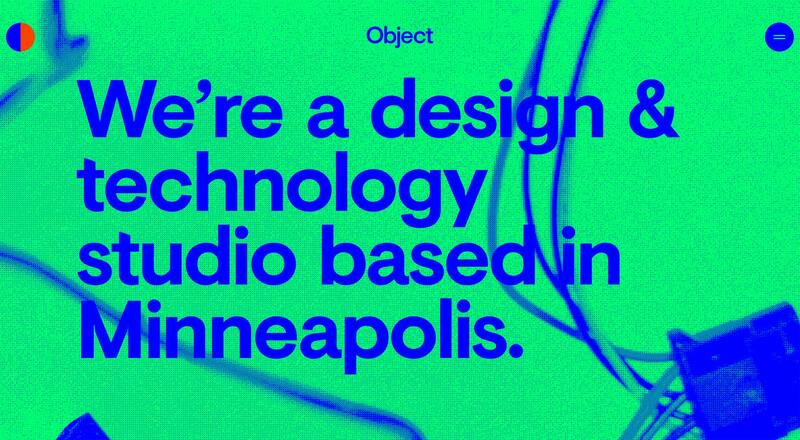 $100,000+, you can demand special pricing. Paypal Payments Pro – $30. If you have questions and concerns, you can get professional assistance from PayPal support team via email or telephone (toll-free). 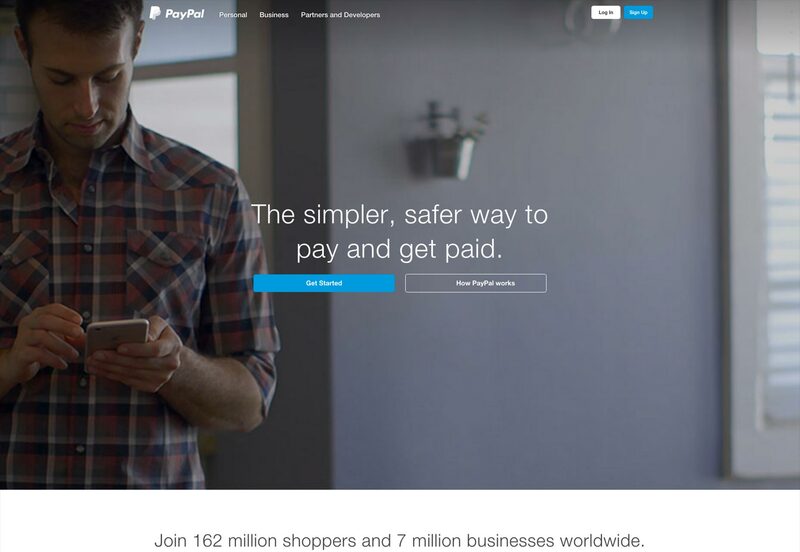 Summing it all up, PayPal is a great payment option for a new website. Also, it can be used as a second-form payment method for all online businesses. The service is easy to set up, convenient to manage, and widely accepted. If you are running a brand new e-commerce business and are looking for a provider to help you quickly accept online payment, PayPal is the way to go. which channels generate most conversions. This type of data helps you discover your sales trends, optimize sales channels, tweak store merchandising and enhance relationships with your customers. Also, having this data you will be able to adapt and get ahead of the competition. 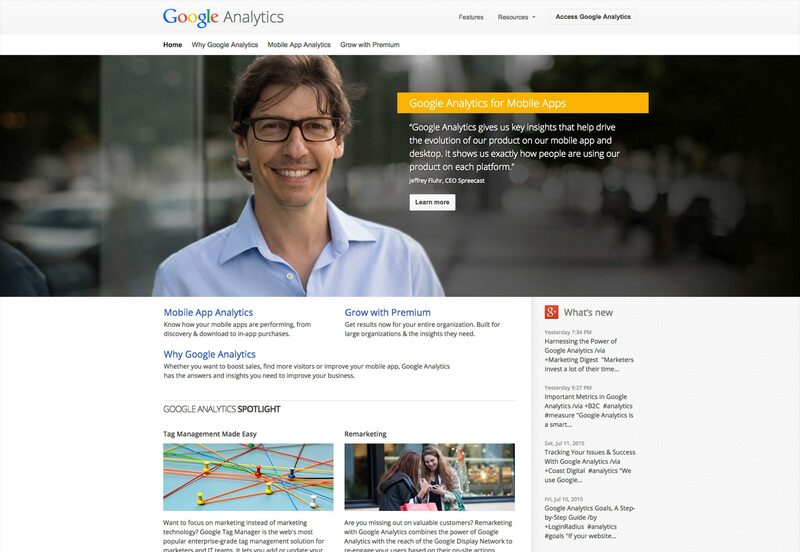 Alas, free tools like Google Analytics only tell you half of the story. They don’t deliver any data on refunds, taxes, shipping expenses, which can greatly affect your revenue numbers. Other free solutions provide you with spreadsheets that contain raw data, and you have to spend hours sorting and analyzing it. 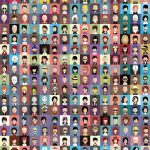 Luckily, there are some paid e-commerce analytics solutions that let you see the full picture. 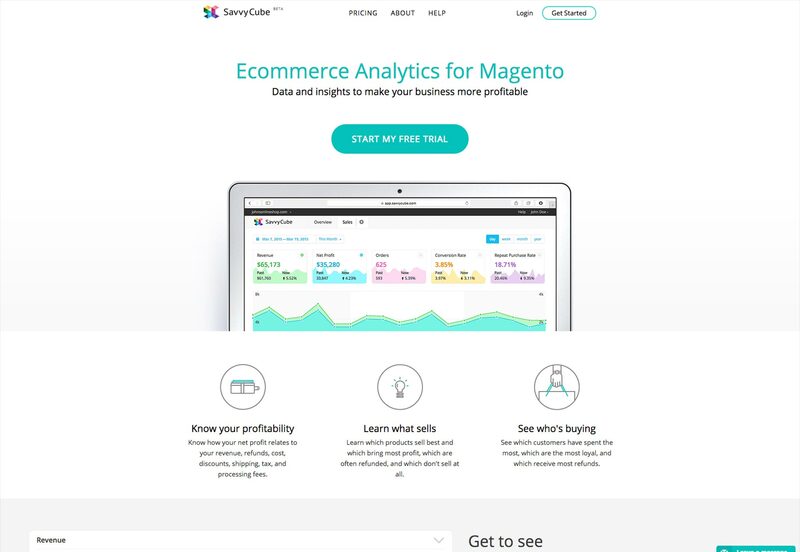 SavvyCube is SAAS-based eCommece analytics for small and midsize Magento-based stores. The application lets you get precise and reliable insight into how your online business is currently doing. SavvyCube is easy to set up and doesn’t require any technical know-how. The data gets pulled from multiple sources (Magento itself, Google Analytics and PayPal) directly and then combined in one comprehensive e-commerce report. The report shows how profitable your online business has been over a certain period of time. In the report, you can easily check your revenue and Net Profit (and avoid complicated, time-consuming manual Excel calculations), and see the total amount of refunds, taxes, shipping expenses and payment provider fees. SavvyCube shows what sells best, so you can quickly check which products are most popular and bring most profit, which items don’t sell at all, and which products are more frequently refunded. Also, the software lets you analyze your customers’ shopping behavior. With SavvyCube you can easily check who buys most and who spends least. This info can help you segment your customer audience into specific customer groups and shape a more effective loyalty program. SavvyCube delivers a complete list of referring channels that resulted in a conversion on your website. On top of that, your online store sales performance can be compared with any chosen period in the past. It has a free 30-day trial period. When the trial runs out, you can subscribe to one of the three available pricing plans: Basic ($24 per month), Professional ($49 per month) and Advanced ($49 per month). 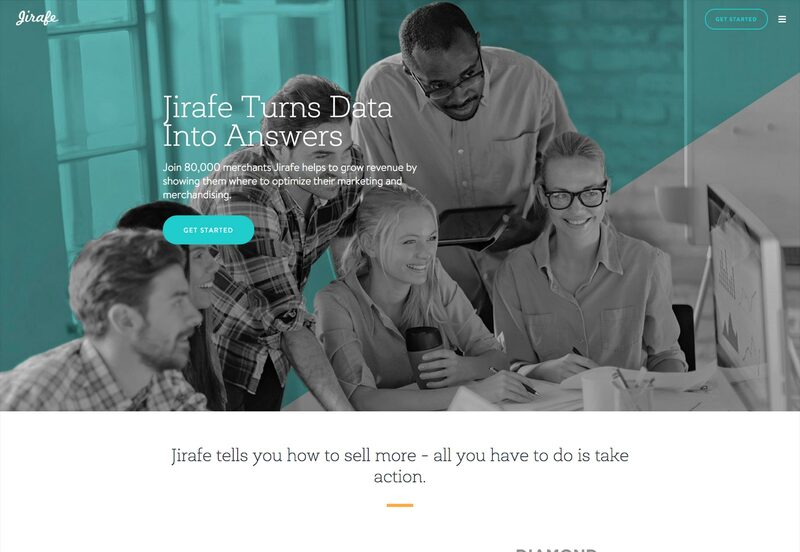 Jirafe is a SAAS-based e-commerce analytics that can be easily integrated into different e-commerce platforms, including Shopify, Spree, Volution, Symphony Commerce, and others. 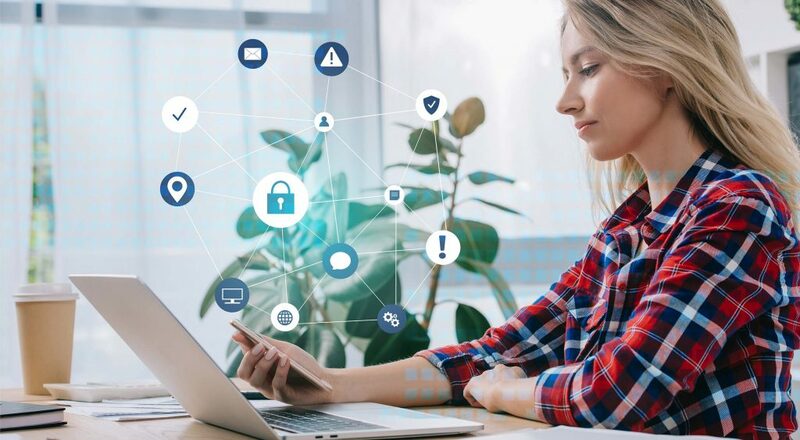 Although the software has a wide range of features for enterprise level e-commerce businesses, it can also be effectively used by small and midsize online stores. 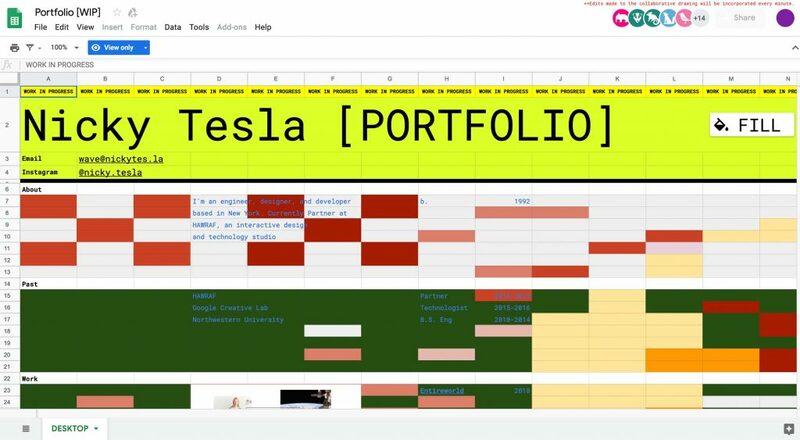 Jirafe collects data from multiple sources and compiles it all together under a beautiful user-friendly interface. The app’s dashboard is fully customizable. You can add widgets, customize them or remove/hide the ones you don’t need. With the software, you can not only check how your business is currently doing, but also work out a more effective sales and marketing strategy. Jirafe tells you which marketing channels drive more traffic to your store and how this traffic converts. You can even dig deeper and find out which keywords, social media, or email campaigns bring more visitors that purchase on your site. The app delivers a daily list of the best-selling products from the previous day, so you instantly overview all the changes in buying patterns as they occur. Also, Jirafe tells which customers spend more on your site, which frequently return your products or request refunds. Jirafe has 5 subscription plans: the cheapest one starts at $499 per month, which can be too expensive for a startup online business. However, when your store starts to generate more profit, you may consider subscribing to this great analytics tool. Handling the books manually or using spreadsheets wastes an immense amount of time. Automating the process with accounting software can save a small business owner hours of hard and tedious work. Moreover, these tools significantly optimize the booking process and take the headache out of finances management process. tools to help with tax preparation and tax reporting. 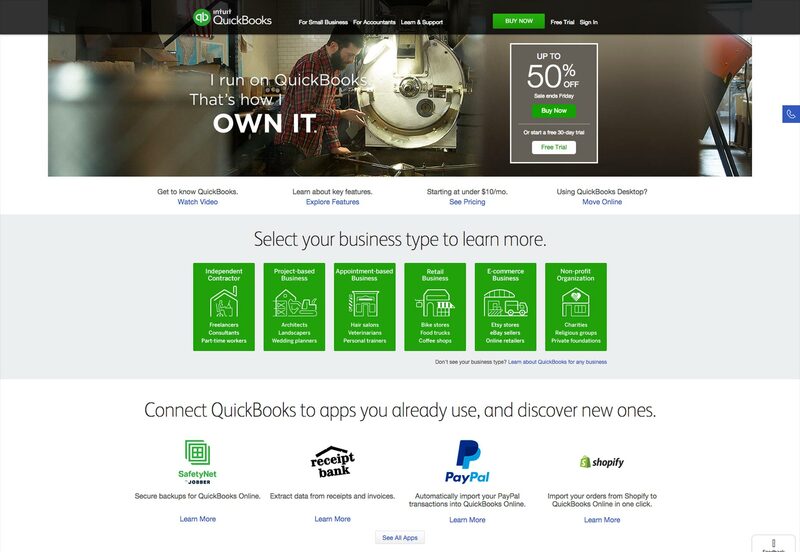 QuickBooks Online is perhaps the most popular online-based accounting software with about 700,000 businesses using it, and 1.3 million unique users. It is highly rated by its users, and has garnered a number of awards over the recent years. The software setup is very simple. Upon registration, you will be asked to select your type of online business and customize the software settings for your personal needs. QuickBooks Online has a clean intuitive interface. You can easily navigate between different sections to overview your sales history, track payments, check invoice details, add users, and edit permissions. Also, with the tool you can set your own custom feeds. With QuickBooks Online you can easily create profit, loss and trade sheets as well as billing and invoice solutions that can be viewed on any mobile device and printed out whenever needed. The software advanced reporting facilities have dozens of stock reports. Each report can be customized and filtered. Simple Start ($12.95/month): Comes with the ability to create estimates, invoices, and download bank transactions. Can be used by one user only on PC, Mac or mobile devices. Essentials ($26.95/month): Has all the features of Simple plan, plus the ability to manage and pay bills. Can be used by three people. Plus ($39.95/month): In addition to all the above mentioned features, the software is capable of tracking inventory. Up to five users can use it at the same time. QuickBooks online has an extensive knowledge base, hosts a community forum and responds to support queries within 24 hours during the normal business week. 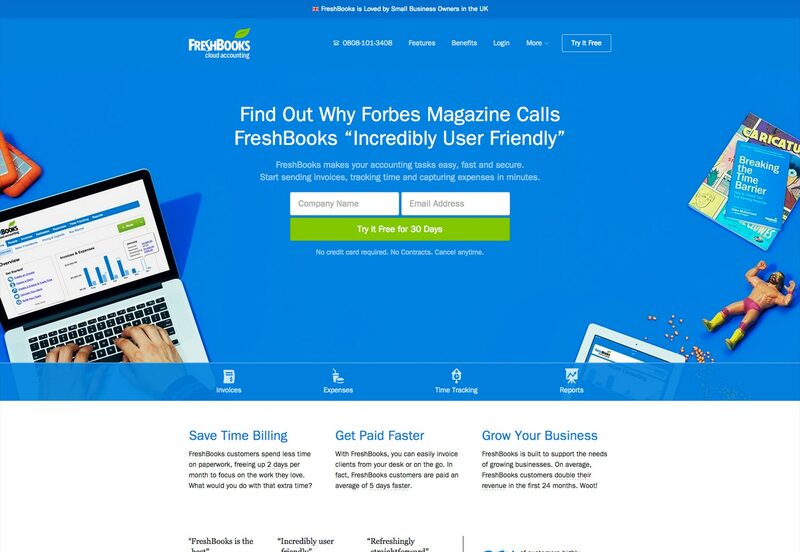 FreshBooks is another cloud-based accounting software that is popular with startup online entrepreneurs. It is is of great help in creating and managing invoices, tracking time and managing products. Small web businesses can also use the tool for effective client list management, collecting payments, reviewing bookkeeping stats and synchronizing reports with their accountants. With FreshBooks, it only takes a couple of minutes to create a branded invoice. Also, you can quickly convert an estimate into an invoice and potentially get payments by accepting payments online a lot faster. On top of that, you can easily track your time and expenses, and manage time sheets anywhere using free apps for Android and iOS. FreshBooks also lets you generate different types of reports on expenses, profit and loss, payments collected, recurring revenue by client, extenuated billing, taxes, and many more. In addition to the ability to integrate with different payment gateways, FreshBooks works perfectly with apps such as Gmail, MailChimp, Basecamp, Zendesk, or estimate creators like QuoteRoller. Alas, you won’t be able to use FreshBooks when your business grows. The software is not equipped to manage large volumes of inventory, and is incapable of managing complex vendor and purchase-order situations. However, it’s a great tool for a startup business, mainly because of the affordable price. Compared to Quickbooks, FreshBooks has a low-cost and scalable pricing model. The cheapest subscription is $9.95 per month. Yes, SEO marketing may offer you a huge number tools that promise to fully automate the SEO process, bring you huge traffic and profits in less time. But don’t fall for these promises! 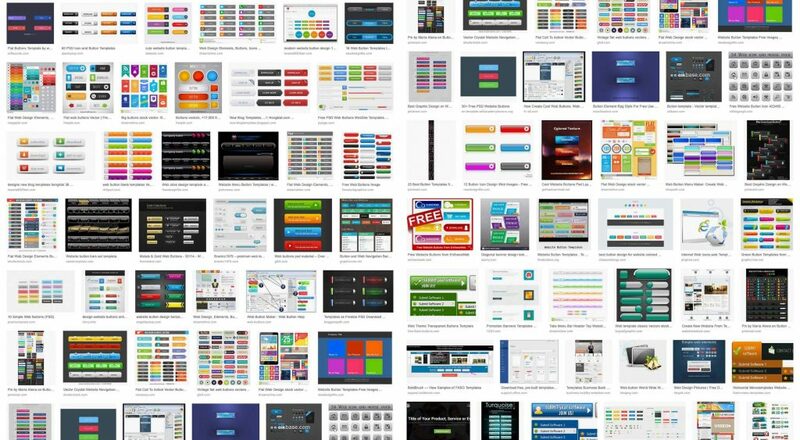 Most of these tools are useless and can even get your website penalized by Google. Search engine algorithms are getting more and more complicated, and so is truly reliable SEO software. Really worthy SEO tools are getting more and more difficult to master. And they cost a lot. So, rather than spending your precious time and budget on pricey, sophisticated SEO software, hire a reliable SEO specialist or an SEO agency. They will handle the ins and outs of your SEO and search marketing strategy and so you can focus on other important things. The most frequent SEO task is checking site search engine rankings. Precise ranking data can give a clear insight of how effectively one’s SEO budget is being spent, and tell you how to optimize the whole SEO process for a better effect. RankWatch can be of great help with that. It is a cloud-based rank tracking tool that will let you check position on up to 250 keywords just for $29/month. The software delivers detailed ranking results based on your location. For instance, if you are located in the UK, this tool will automatically pick an IP from there and track rankings for you. What is more, you can specify the location manually and choose the search engine along with the specific city to see how your store is ranking there. 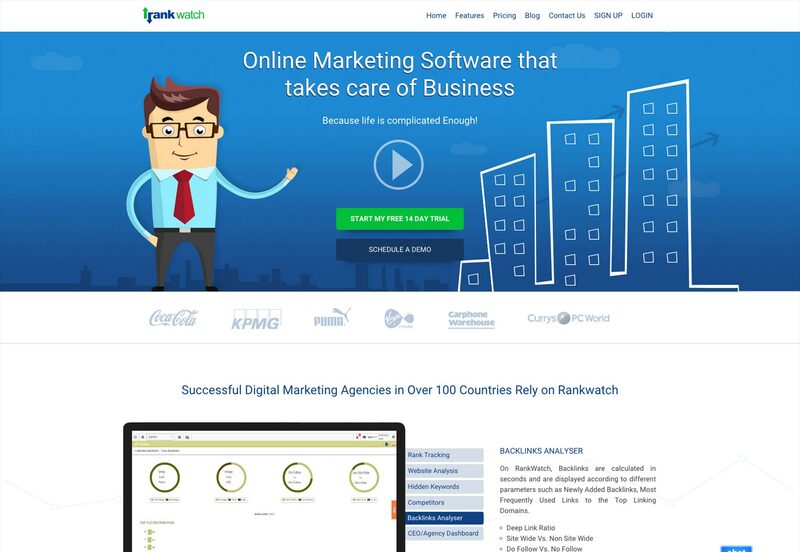 RankWatch is also capable of suggesting the keywords that are worth being optimized for. The list the software delivers contains long-tale, city-specific keywords, similar keywords etc. In addition, with a $29/month plan you will get basic reports on your website visibility, your backlinks and the competition. The software enables you to receive ranking reports by email and send them to your colleagues whenever needed. 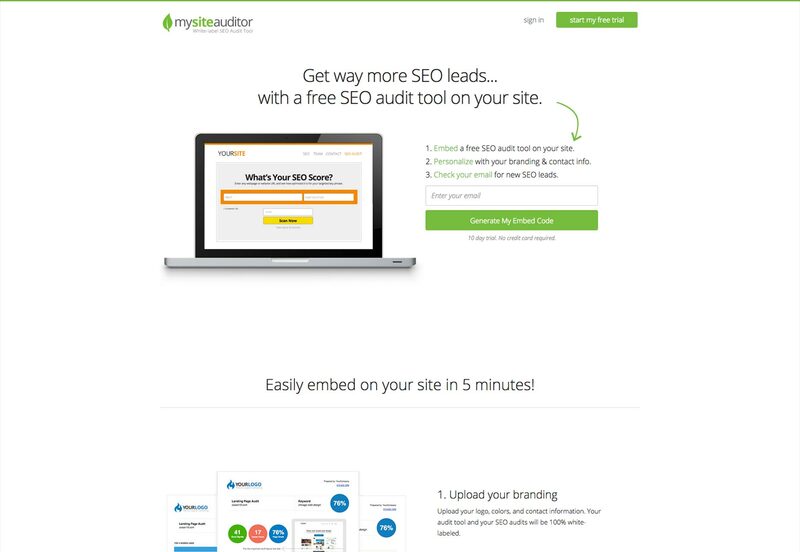 MySiteAuditor is an easy-to-afford, user-friendly app for checking how SEO-healthy your website is. All you need to do to run your site audit is to enter its URL and the list of targeted keywords. The software will do the rest and email you a detailed SEO report as soon as it’s ready. The report will tell you which sections of your website need improvement. The analyzed areas include: site URLs, tags, copy, images, links, site speed, domain and some others. For example, you may learn that in order to improve your site SEO performance you need to reduce pages’ load time, shorten your description tags, include keywords in image file names, or reduce the number of file requests on the page. The biggest drawback of MySiteAuditor reports, is the inability to provide any additional guidance on to how to fix all the above mentioned issues. The basic plan starts from $29/ month. With this type of a subscription you can run an unlimited amount of SEO site audits, archive and download, print and email the reports. Also, there is a 10-day free trial, which may be enough for you to run a basic SEO audit of your new e-commerce store. 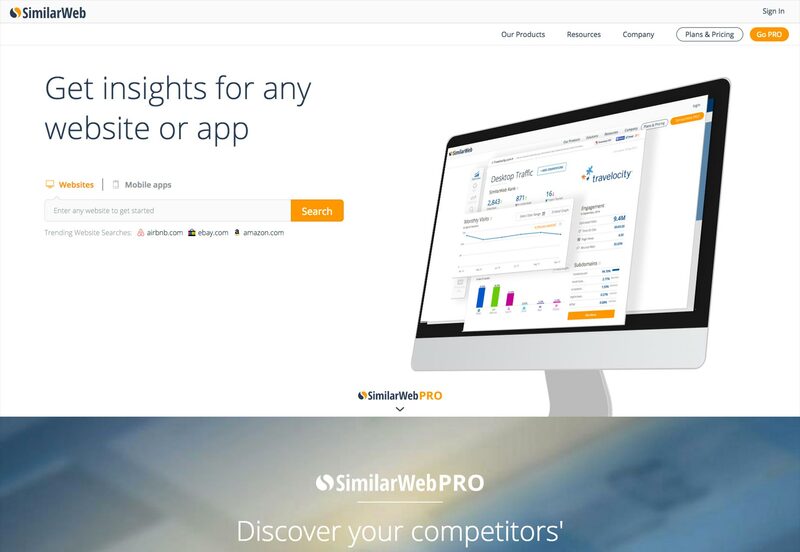 SimilarWeb offers a free service that lets you overview your site performance and check how the competition is doing. Just enter the URL of any website, and you will immediately get tons of valuable SEO insights. The software lets you get such important SEO data as website global rank, engagements (that includes the amount of page views, time on-site, bounce rate, etc. ), the amount of traffic that comes to this site from various sources, and keywords that are driving the biggest amount of traffic to the site you analyze. Also, SimiarWeb Free allows you to check the main interests of site audience. You can find out which sections of a website are the most popular, which categories are the most visited and which products generate more interest. Thus, with the free version of the service you can gain valuable data on your and your competitors’ keywords, popular pages, referral sources and more. That, in turn, will help you shape better SEO tactics and enhance your SEO campaigns. These days, social media has become a new channel of digital influence and an effective tool for building brand awareness. 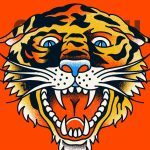 So it’s impossible for a new brand to be successful online without some sort of social media presence. Facebook, Twitter, Pinterest, Instagram, and other networks can be used for practically everything from real-time engagement to customer service and direct sales. get detailed reports on the effectiveness of your social media campaigns. 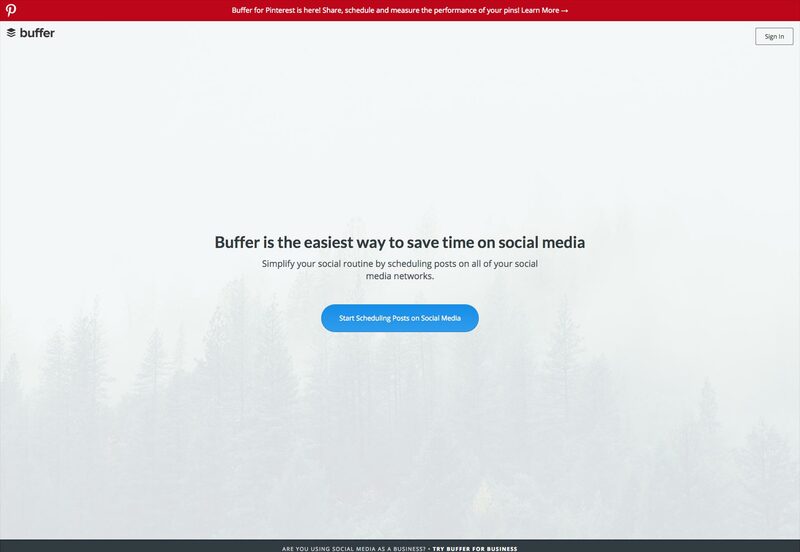 Buffer is a simple Web-based app that lets you keep multiple social media accounts regularly updated. With the software you can automate posting across various social media and analyze how well your social media marketing strategies work. Buffer supports Facebook (both personal profiles, business pages and groups), Twitter, LinkedIn (personal profiles, company pages and groups) and Google Plus pages. Whichever network you may want to post on, your posts will be adjusted to look natural. On top of that, this simple tool has useful reporting functionality. It generates simple, yet informative SMM reports that let you measure the performance of each and every post you have made. With Buffer you can see what type of content your audience actually likes, find out the best time to post, and adjust your social media activities for a better effect. 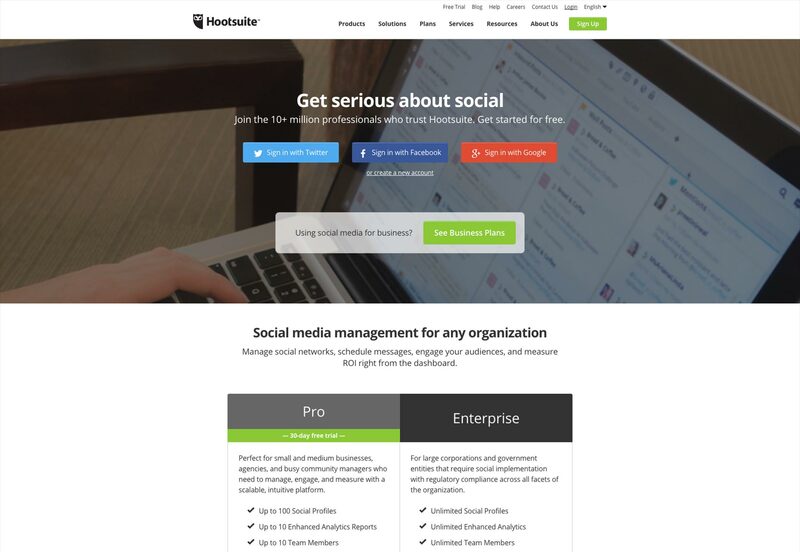 HootSuite is Web-based software that combines all of your social media account streams into one user-friendly dashboard. The app is a great time-saver. In addition to the ability to schedule posting across multiple networks, HootSuite lets you perform a wide range of social activities all in one place: retweet, “like”, share, respond to private messages, etc. Also, you can monitor your online reputation. Using your keywords you can find what people are saying about your brand on social media, engage with them and even change a negative customer perception of your brand. Currently HootSuite supports over 35 popular social networks, including Facebook, Twitter, Google+, WordPress, LinkedIn, Foursquare, YouTube, and even apps such as Instagram. What is more, HootSuite delivers in-depth social media reports. 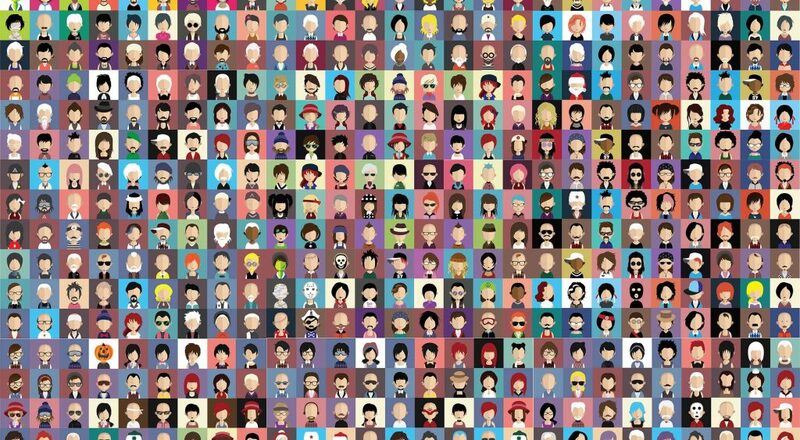 The reports visualize your social demographics, let you identify your niche influencers, see what type of social content resonates most, and track how your brand is growing socially. The software is limited to five social profiles in the free version. This can be enough for a really small startup business. The pro version (starts from $9.99/month) is good for a small team and offers more features such as a greater number of social profiles, unlimited RSS, advanced message scheduling, up to 10 social reports, and more. Email marketing is an important component of any lead generation strategy. It helps e-commerce businesses generate high quality leads and keep them engaged. Hence, a well-organized email campaign can complement the business model of almost every small e-commerce business. Start working on building your email list right from the start. When you collect a decent portion of email addresses, start marketing to them. 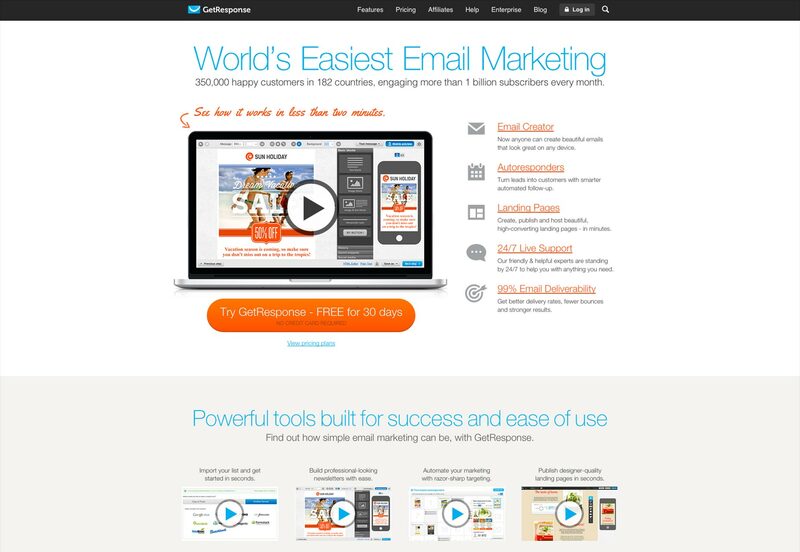 These tools will let you organize an email campaign quickly and efficiently. All you will need to do is to upload your email list, create and customize an email template. get detailed reports on the effectiveness of each campaign. MailChimp is a SAAS email provider that offers one of the best free plans for those who are on a tight budget and have a small list of email subscribers (up to 2,000). The forever-free plan requires no contact, or credit card details. But to get access to such important features as an email auto-responder, A/B testing capabilities and the features that help you avoid getting caught by spam filters, you need to upgrade to the paid version (starts at $10/month). 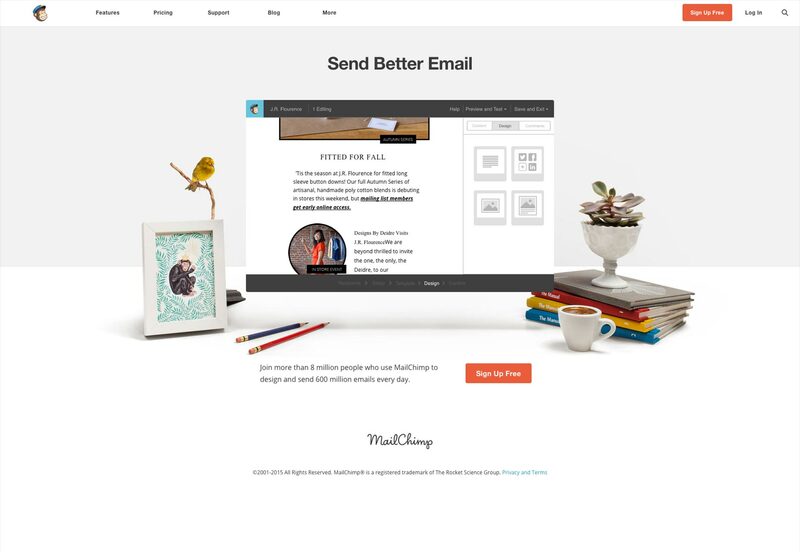 MailChimp makes it really easy to create an email template. Even if you don’t have any knowledge of HTML, the user friendly email editor will let you easily tailor an eye-catching newsletter. Also, the software will help you with writing killer subject lines. The tool analyses the history and industry statistics and tells you how well your headline may perform. MailChimp is fitted with top-notch analytical features that provide a deep insight into how well your email marketing works. The advanced reports reveal such important metrics as click rate, open rate, the number of bounced emails, unsubscribes, abuse reports, and dozens more. Also, the software reports let you compare your email performance against other email marketers in your industry and see the industry average. MailChimp seamlessly integrates with dozens of apps and services including Google, Twitter, Facebook, Magento, Shopify, and even Google Analytics. So, you can synchronize all your data, merge contacts from other sources, and more. 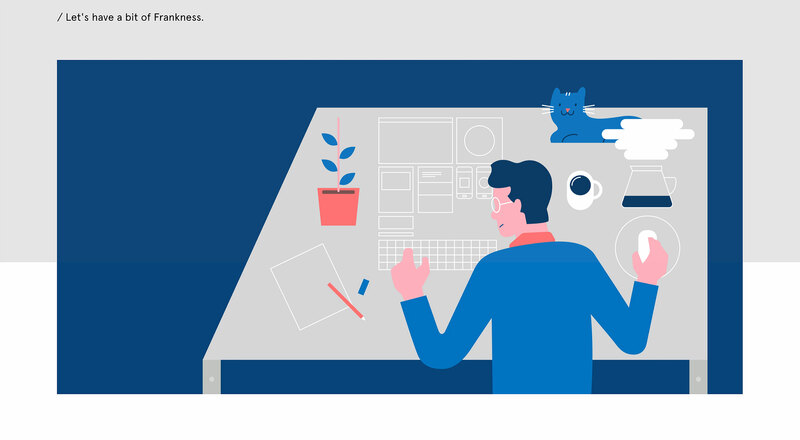 GetResponse is an email marketing service that comes with a bunch of great email templates, a set of e-newsletter design tools and dozens of useful analytics features. If you have a lengthy list of 7,000-10,000 emails on your database, GetResponse will handle it for $65/month. Currently, it’s the cheapest solution on the market (just to compare: it’s $4/month cheaper than Aweber and $10 cheaper than MailChimp). For this price you will also get a wide selection of email templates (with responsive designs), advanced segmentation options, tools for social sharing and even a free landing page creator. In addition, the software has excellent auto-responder functionality, great features for split testing, RSS/blog to-email options, and the ability to import data in various ways (from CSV, Excel files, from Gmail and some other data split testing. Also, GetResponse is famous for its reports and analytics. The software not only lets you check the basic performance indicators (such as open rate, CTR, unsubscribe rates, etc), it also has a selection of top-notch features, e.g. one-click segmentation, the ability to track/compare metrics over time and calculating email ROI. There is a stereotype that marketing automation is not right for a small e-commerce business. The majority of small online entrepreneurs tend to avoid investing in it, mainly because of the high price and complexity of the whole process. 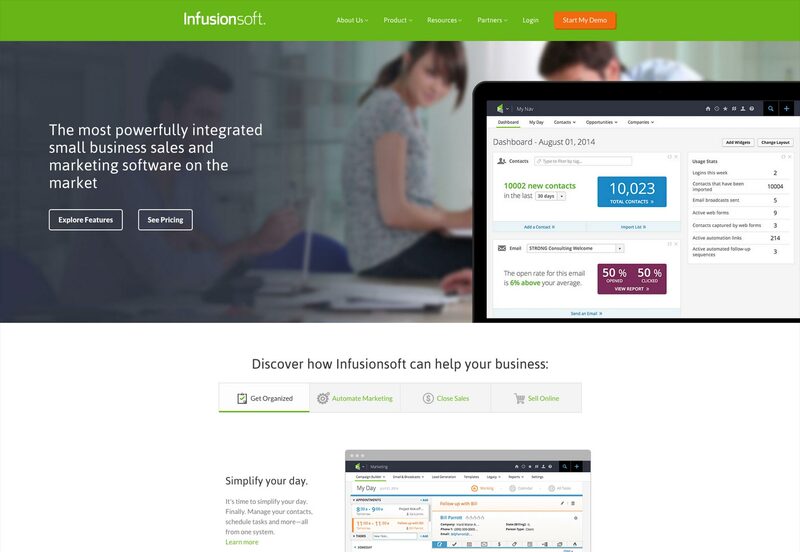 InfusionSoft is marketing automation software built exclusively for small e-commerce businesses. This cloud-based platform is currently used by 20K+ online entrepreneurs whose annual revenue ranges from $50,000 – $1,000,000. InfusionSoft is an all-in-one solution that combines the efficiency of automated processes with multiple tools for simplifying sales and marketing tasks. All that allows a beginner e-commerce entrepreneur to do much more while paying much less for the same amount of work. InfusionSoft offers flexible pricing schemes (no contracts required). The pricing plans start with $199/month for the “Essentials” package and go up to $379/month for the “Complete” package. 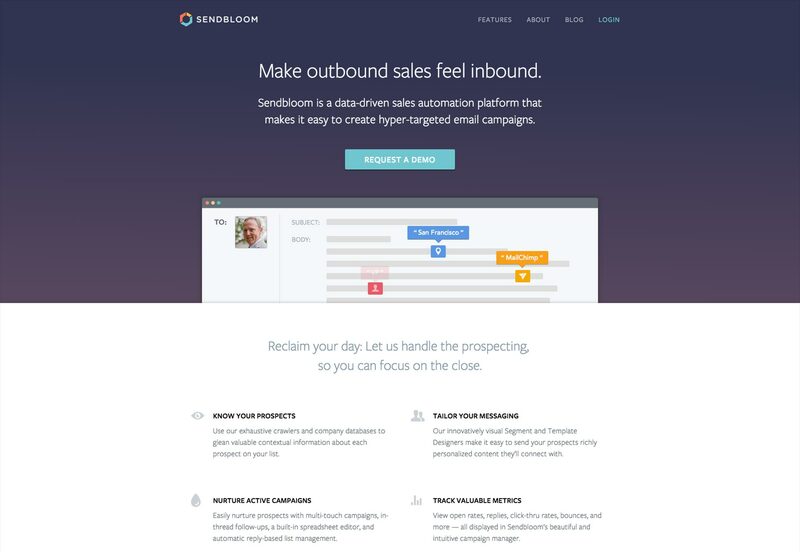 Sendbloom is another marketing automation tool ideal for small businesses. The software was designed to simplify companies’ outbound sales processes. With Sendbloom, one can tailor super-targeted, personalized email campaigns that produce a high engagement rate. It saves a small store a lot of time and resources by mimicking salespeople activities: doing personalized outreach, cultivating relationships and building brand loyalty. This is how the software works: your lead list gets enriched with data from various public and private sources; this data then gets to the fields in your email templates; email templates can be further customized with the consideration of a wide range of factors, such as your business location, industry, job position, etc; All that lets you compose unique templates for any segment you define. On top of that, you can get a detailed report on each campaign; view the number of opens, replies, link clicks, bounce rate, and more. There’s always room for improvement. But with the lack of time and resources, how do startup online entrepreneurs know where to put their energy? You just create two versions of one and the same page. Segment site traffic into different groups. Display each group a different version of the same landing page. Analyze which one brings better results. Hence, A/B testing lets you easily remove all guesswork from your website optimization activities and use only the techniques that work. Google offers a free service for A/B and multivariate testing. The tool lets you set up basic A/B tests as well as complex experiments that involve multiple variables. The service is fully compatible with AdWords and other popular Google marketing products. On top of that, Google provides a large number of tutorials on how to get most out of the service. 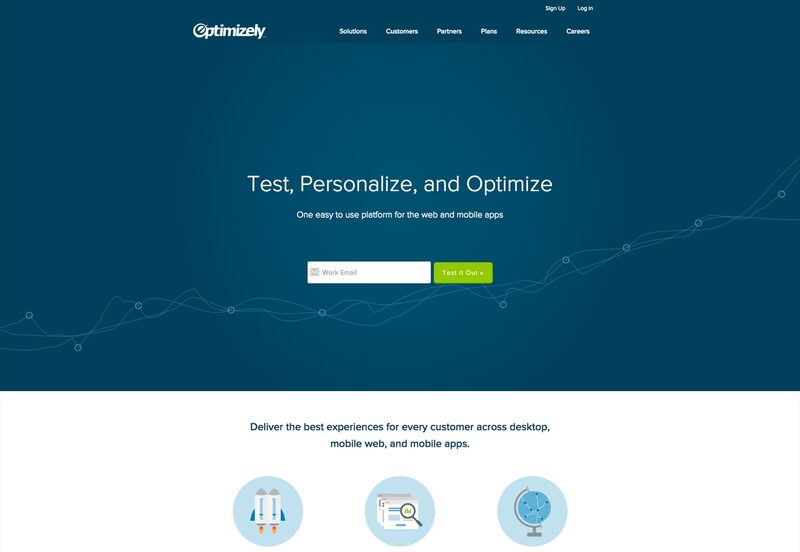 Optimizely is a reasonably priced online tool for A/B and multivariate testing. The service has a clean user-friendly interface and is easy to master even if you have little or no understanding on how A/B testing works. Also, Optimizely is not only about A/B testing. The software is capable of streamlining a large amount of valuable e-commerce data, so one can easily identify trends and patterns to efficiently optimize any advertising campaign. The software is fitted with a browser-based WYSIWYG editor that can create alternate versions of any given page. The only thing you need to do is to drop a single line of code before the closing tag. Optimizely is also equipped with a wide range of analytics features. The app lets you track practically everything: clicks, engagement, conversion rate, the amount of sign ups, and any other important metrics that are related to A/B testing. Unlike Google Analytics, the software delivers all data available in real-time, which is a great advantage. Plans start at $19/month. Bronze and Silver packages will be the best for any e-commerce startup needs. Phew! Have I missed anything? Yeah, this has been a long read. Hopefully, this list of tools will help you effectively run your e-commerce business right from the start and avoid unnecessary expenses; because every dollar saved, is a dollar earned. Good luck! Featured image, e-commerce image via Shutterstock.